The Santa Susana Field Laboratory Work Group February 5 in Simi Valley gave community members a chance to learn more about the details and progress of current cleanup agreements for the polluted former nuclear and rocket testing facility. SSFL sits in the hills between the Simi and San Fernando valleys and operated for over half a century beginning in the late 1940s. Dan Hirsch, president of the nuclear watch-dog group Committee to Bridge the Gap, presented on the Agreements on Consent that NASA and the Department of Energy (DOE) signed with the California Department of Toxic Substances Control (DTSC) in 2010 to clean up their portions of SSFL to background levels of contamination. Hirsch explained the agreement in simple terms, “What they contaminated, they will clean up, if they can find it. If it’s at a level below a detection limit, they don’t have to cleanup what they can’t detect.” He noted that the AOC includes in situ [in place] treatment as an option for remediating contaminated soil, and that the agreement includes exceptions for endangered species and Native American artifacts. In closing, Hirsch noted that some community members had gotten nervous that the agencies may be trying to break the cleanup commitments, and that there might not be any cleanup at all. 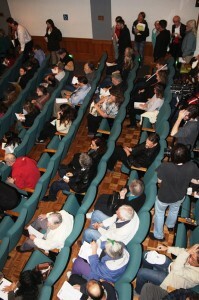 John Jones, DOE federal project director for SSFL, gave a short presentation that seemed to allay such fears. The very next night, however, Jones hosted a DOE Soils Treatability Investigation Group (STIG) meeting at the Radisson Hotel in Chatsworth, at which he said that 1,700,000 cubic yards of soil would have to be removed from the DOE area, according to one attendee. Jones also claimed that a bag of dirt he bought from the store would have to be cleaned up if AOC levels were employed. That must have been some monstrously hot dirt, given the already high look up tables for radiological trigger levels. More likely, it is a ploy intended to misinform and alarm the community. Jones’s stunt indicates that DOE is anything but as enthusiastic as he portrayed at the Work Group meeting to meaningfully remediate Area IV. Two subsequent public scoping hearings (covered in upcoming EnviroReporter.com reporting) also demonstrated that DOE’s commitment to the AOC may in fact have been an empty promise. Following Jones at Work Group event was NASA’s Peter Zorba, SSFL project manager for the space agency. Zorba described activities NASA had taken to date in preparing its Environmental Impact Statement (EIS), estimating that upwards of 480,000 to 500,000 cubic yards of soil had been fouled by half a century’s 30,000 rocket engine tests. Zorba made no clear commitment to the AOC, prompting Hirsch to play a videotape of NASA associate administrator Richard Keegan telling Congresswoman Julia Brownley (D- Thousand Oaks) that NASA was committed to the AOC, despite a previous Inspector General report stating the cleanup was too costly. With prodding from Hirsch, Zorba indicated that NASA remained committed. Hirsch responded, “We’ll see what happens in March,” referring to the release of NASA’s final Environmental Impact Statement (EIS), due out this month. DTSC’s Ray Leclerc, department project director for SSFL, was much more direct. “We are committed to the AOCs and as necessary, we will enforce the AOCs,” he said to cheers and applause. But now, the department will host a meeting about the risks to the public from the cleanup, a topic that seems to be aimed squarely at creating concerns that the clean up – not the contamination – is the problem, a move which calls into question the sincerity of it’s previously avowed commitment to the cleanup agreements. Despite the lengthy name, the presentation shortly elucidated gasps of incredulity from the audience. It was easy to see why. Miska’s presentation showed radioactive Area IV buildings being torn down by Boeing with tons of irradiated metal being sent to recyclers and even more sent to dumps not designed for radioactive waste. And all of it approved by looking the other way by DTSC and CDPH, or DPH as it is referred to in court documents. Recycled radioactive metal is not a new issue but it is a potentially life and death dispersion of lethal radionuclides into the consumer product stream unbeknownst to the purchaser. It certainly is a lot cheaper than disposing of radioactive metal, concrete and other debris in a licensed radioactive dump. Now Boeing, which bought the majority of SSFL in 1996, has been caught doing the same thing again only this time, the numbers are even more staggering. Over 1,150 tons of radioactive waste was dumped in Class One landfills designed for chemical, not radioactive, disposal. About 568 tons of rad waste generated by Boeing during the teardowns and structural excavations went to Class Two industrial dumps also not used for radiation debris. So pervasive was this dumping that 242 tons ended up in Southern California municipal dumps. Even more was recycled. Nearly 500 tons of metal were recycled into the commercial metal product stream. Over 2,400 tons of concrete and asphalt were recycled. That’s a lot of metal for kids’ braces and asphalt and concrete for them to play on sidewalks and at playgrounds. These are no ordinary buildings. 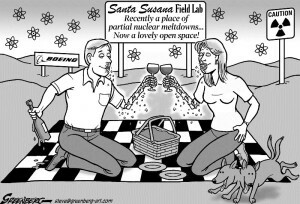 They are some of the hottest of the hot in a place that had three partial meltdowns, a hot lab and a burning pool of radioactive sodium across a huge space in the middle of the DOE nuclear complex. It’s no wonder that nuclear workers in Area IV succeeded in getting compensation for the colossal amounts of radioactive contamination that they were exposed to, thanks to the efforts of Work Group panelist Bonnie Klea aka The Atomic Avenger. Miska showed photos of the torn down buildings which begged credulity that anyone, even Boeing, would think these edifices and foundations could somehow be safe to recycle or dump in municipal landfills. Evidence of unsafe Boeing demolition was exposed by EnviroReporter.com in December 2012 giving good cause for concern over how sloppy the company’s contractors were allowed to be destroying these radiation facilities. 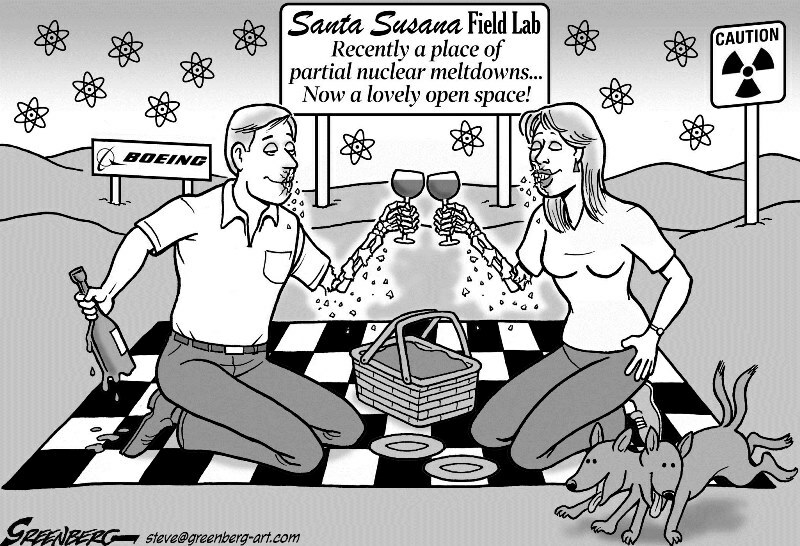 Boeing tore down Area IV Building 4005 which “managed” depleted and enriched uranium, according to multiple reports. The foundations were also dug up. Building 4005 had a hot history of trouble. A uranium fire released smoke throughout the building January 30, 1967 and a concrete pad was irradiated August 8, 1991 when radioactive oil from a hot exhaust duct dripped on it. Now the place has been torn up, recycled or dumped in places not meant for radioactive rubble. Building 4093 was also going to get the same knockdown treatment by Boeing despite its record of radiation contamination. That pollution shouldn’t be surprising since the building housed the L-85/AE-6 reactor which was fueled by 93.11 percent enriched uranium-235. According to a company report, other “radionuclides of concern” at the building site included cesium-137, strontium-90, cobalt-60, and uranium-238. It’s not surprising that Building 4093’s radiation remains should be of concern considering its use and the litany of accidents at it. A fission gas leak March 25, 1959 contaminated part of the reactor’s high bay and the employees in it with a whopping 7.5 to 13 millirem per hour of the hot stuff. An employee and part of the high bay were contaminated July 30, 1982 by spilled uranium-235 and a radioactive filter was found tossed into ‘normal’ debris May 24, 1995. These are just the reported screw-ups. Evidence shows that Building 4093’s environs are still hot today. Even after two radiation remediation attempts that DOE and Boeing claim have taken place in Area IV years ago, mammoth measurements of radiation still remain. A map of the area in one of the $41.5 million EPA radiation study appendices shows sky-high strontium-90 readings (see inset map). Far from being cleaned up, the higher Sr-90 reading is over 195 times background. Just as shocking, the “Radioactive Trigger Level” (RTL) in the sample reading box is nowhere near background which it should be according to the AOC signed by DOE and DTSC in 2010; instead it is over 37 times background. This is the essence of the $41.5 million fraud: The radiation measurements were extremely accurate but the RTLs are way over background. After hot dirt samples like this one, and thousands of others that were taken and measured in laboratories, EPA along with DTSC manipulated the RTLs so as to make them much higher than background. That way, the trigger for cleanup was so high barely any cleanup would be needed at all. Another facility ripped from the ground before the court injunction was the Empire State Atomic Development Authority, or ESADA. A bed plate at the site clocked in at 266 disintegrations per minute of highly dangerous alpha radiation before it was torn up. Nothing over 20 disintegrations should have been removed according to Boeing’s own radiation survey of the ESADA. 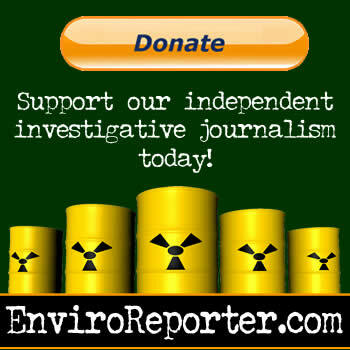 EnviroReporter.com exposed the possible connection between the ESADA’s radiation and heavy metals contamination and that found in Area IV-adjacent Runkle Canyon in There Lies the Fault in 2009. 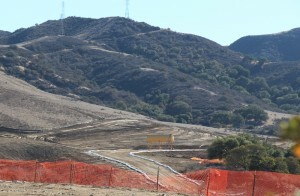 Now, after years of concerted effort by the City of Simi Valley and KB Home to discount radiation and heavy metal contamination in Runkle Canyon, the tractors have begun leveling the hillsides since December 2013. When the floor was opened for Work Group panel questions, many in the audience expressed concern about the dust landing on their homes from KB Home construction in controversial Runkle Canyon. Most of these folks were new to the issues but they sure knew what dust was. KB Home began construction last December on 461 homes in Runkle Canyon. Higher on the 1,595-acre property, KB Home’s property borders Area IV of the Santa Susana Field Laboratory. A local citizens group called the Radiation Rangers have fought the development since 2006 and found high heavy metals in Runkle Creek in 2007. The City of Simi Valley subsequently tested the creek and found even higher levels of the toxins. What was in that dust was what many in the Work Group audience wanted to know. And how much. This reporter broke the news in March 2005 that one of the developers before KB Home acquired Runkle Canyon hired an environmental firm that found high strontium-90 levels in Runkle Canyon soil. Costa Mesa-based Foster Wheeler’s 58 soil samples averaged 1.39 picocuries per gram (pCi/g), or six times the EPA’s Preliminary Remediation Goal (PRG) and nearly 27 times above the typical EPA background level for Sr-90 in the area at that time. Runkle Canyon dust settling over Simi Valley neighborhoods may be even more unsettling to residents when the tonnage of it is figured in. 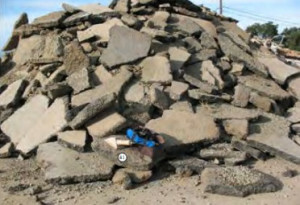 A 2005 Runkle Canyon’s fugitive dust analysis that was derived from numbers in the developer’s 2004 EIR showed that 112.26 tons of dust will be generated by construction. Strontium-90 is considered even more dangerous than its beta-emitting cousin cesium-137. Both are bone and blood seeking elements that the body mistakes for calcium. Leukemia and other blood cancers are caused by strontium-90. The laughter quickly subsided as that potential reality sunk in. “Let me explain what’s behind the question,” answered Hirsch beginning an explanation that spelled out what’s at stake for the future of Rocketdyne. “The Boeing Company as I have mentioned has sued to block the cleanup law and it refused to sign the agreement that NASA and DOE did sign. Astonishment registered on many faces in the audience, as they realized the catch – Boeing’s Glow in the Dark Park open space standards would do nothing to protect those who live near the site from SSFL’s contamination. “And that’s what’s their motive because they would save a lot of money,” Hirsch said. “It doesn’t do any good for the people who live nearby. They’re still living in homes. So, there is still pressure to have them exempted from the cleanup agreements and leave vastly larger amounts. NASA and Boeing could then donate their land to the Santa Ynez Band of Chumash Indians with the later taking a healthy tax break as well as both saving hundreds of millions in cleanup cost. Then a massive casino could be built on the site where coins could tumble out of slot machines while SSFL runoff continues its gooey way down through Los Angeles and Ventura counties. As for the community members who want the complex with a glowing past cleaned to background levels of chemicals and radiation, they could go stuff it. NEXT: PART THREE – TRUTH OR SCARE? Wow. The report above was a house rocker. Michael is correct and Dan is correct. DTSC’s employees and management cannot be trusted. 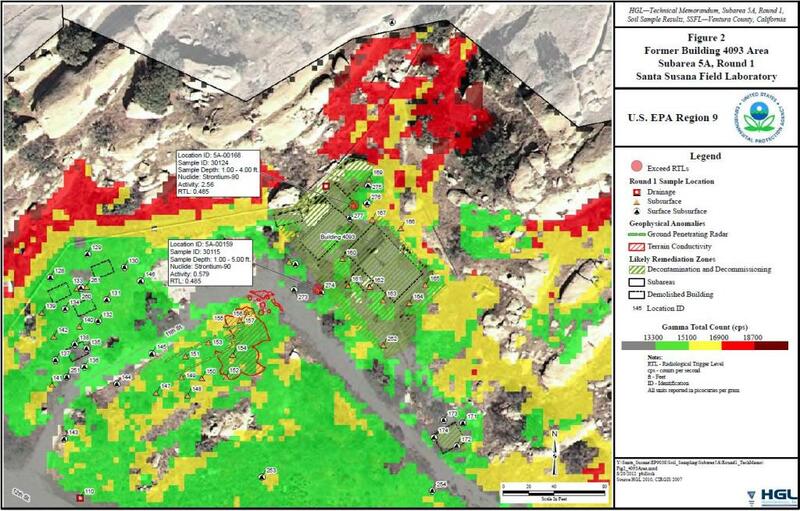 DTSC has a history of approving “dead of night” removals of depleted uranium contaminated soil from the Whittaker Bermite site in Saugus, CA, which served to economically benefit the former property owner, Whittaker Corporation of Simi Valley. The DU contaminated soil had been sitting on the Bermite property for roughly 20 years, held down in large part by a fairly dense brush cover which grew after ammunition testing work at Bermite stopped. 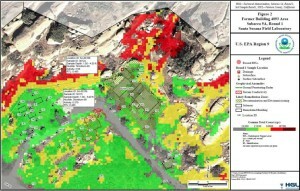 In that circumstance DTSC’s Project Manager approved a contractor hired by Whittaker (a) digging up the DU contaminated soil, (b) placing it in unmarked trucks which were supposed to be covered, but observers said in many cases were not and (c) hauling the DU contaminated soil out of the Santa Clarita Valley in the dead of night, taken through the City of Las Vegas without any notice to that city or the Nevada Highway Patrol and (d) disposed of in Utah. In planning and approving that process, DTSC did not comply with CEQA and moved heaven and earth to keep its plans secret until after the statute of limitations to challenge the plans in court had passed. In planning and approving that process the DTSC asked for input from the L.A. County Health Department, which sent a list of conditions on the “dig up and drive away” which would have protected the public health…but DTSC just ignored those comments. The “public” in Santa Clarita noticed when they started seeing a whole lot of tractor trailer lights on the Bermite property at night. Locals couldn’t get DTSC to admit was going on, but California DPH ratted them out after 300 double truck loads of the DU contaminated soil had been hauled away in the dead of night. The DTSC was unapologetic about what it had done, citing a provision in a 2002 Order it had issued to Whittaker Corporation which said that DTSC could order Whittaker to take action “in an emergency”. Some emergency. The DU contaminated soil had been sitting on the Bermite property for 20 years. Never trust DTSC employees or managers. Even if DTSC has signed a piece of paper. There’s an old expression “you can’t estop the public, or contract away the police power” which means, in English, that the DTSC can change its mind on any issue, unless some court has issued an order or judgment against them. Thank you on your excellent reporting.